I’m seeing a prototype that looks like something out of Existenz. That is so … I literally just finished watching that. Now you’ve got me wondering if I ever stopped. Do you have a sudden urge to hack into computer systems and murder programmers? You may need ocular corrections, I see how if you make the image blurry sure it could look like, a horrible fish egg in some bile/fat mixed meat tasty MacDonald’s anyone!!. Between this and the chicken bone robot, there’s a lot of Cronenberging this week. Remember the good old days of working with clay. Only just yesterday I dug an old trackball out of storage to use on a raspberry Pi I’m setting up for my 18month old to use. Raspberry Pi: can’t find anything more challenging for an 18-month-old to learn, huh? I am using a track ball right now, why the negatives? I have preferred trackball over mouse since I first encountered them in professional music production studios back in the 80’s, the ones that had the cue ball and four buttons that you could customize. Since I do little typing and a fair amount of audio visual stuff the track ball is a superior interface for me – yes I type with 2 fingers and look at the keyboard when I type but I can edit audio files faster than a keyboard/mouse combo could with a track ball. Different strokes for different folks I guess. How did you smooth out those styrofoam pellets for the 3D surface? Didn’t bother with smoothing it out in the scanned model as I completely modelled around it. There are smoothing tools available within ReMake if you really want to smooth it. The ELECOM M-DT2URBK comes in a close second after replacing the ball with one of Logitech’s. I’m more of an M570 fan, though I confess their durability leaves something to be desired. I replace them every year and a half to two years. I loved my Cordless Trackman FX, but Logitech dropped support for it a decade ago. Without their driver, some of its functionality is missing. Microsoft Trackball Optical 1.0. The thumb ball one. Would be nice if they’d bring that back, with silicon carbide bearings instead of steel to support the ball. The steel one easily got flat spots and the ball drags in the socket. There were people rehabbing them with silicon carbide and charging $60 to do it. Logitech had a similar model but it was only 2 button instead of four. I use a Microsoft Trackball Optical at home. When I went looking for another to use at work a few years ago, I was surprised to find that they were no longer made, used ones cost as much as a decent new mouse, and new old stock ones were crazy expensive. I settled on a Logitech M570 but it’s not the same, a little too small for my hand. Nobody seems to know why Microsoft stopped making the Trackball Optical. Lately I have been using a Logitech G600 MMO gaming mouse for my work (software development). I have programmed the extra buttons for quick navigation in my IDE and code comparison tool. If I ever realize my custom trackball, it will be similar to a Microsoft Trackball Optical but with the Logitech hyper-fast scroll wheel and some extra buttons (probably not 12 like the MMO mice have, that’s more than I need and it’s too hard to hit them all accurately). A keyboard geared towards MMO would have been better. I can’t argue with he choice of materials for prototyping this. Simple! Is it the “Floam” only 90s kids are likely to appreciate? Because I’m an early 50s kid and fully appreciate trackballs. Had one on my Atari ST back in eighties. It’s a play on clickbait top 10 list headlines. “Blah blah blah only 90s kids will appreciate” accompanying a picture of, I dunno, Power Rangers or something. Funny, I seem to remember my mother banning the stuff from the house after some got into the carpet. It was subsequently discovered that the stuff might have well been colored superglue after it dried out. I think there’s still a smudge of the stuff on a sleeping bag around here, 15 years later. I did this in the 94, but I used flour to made an ergonomic trackball, which didn’t exist at this time. They weren’t interested, but 6 month later… the ergonomic Trackman Marble came out…. I remember seeing a Military Grade trackball back in the early 90’s that used a cue ball (white ball used on snooker/billiard/pool tables) for the input orb. I have three. Why? Because this is the best form-factor ever for a trackball. Their age (being from the nineties/naughties), indicates that they were either (a) built like a tank, or (b) the design itself made them extremely durable, or (c) both. No, will not sell one; it’s a great place to keep a spare cue ball. Ah, the Golden Age of Nickelodeon Novelty Materials. Gak, Floam, Sqand, and so many others. Well, my dad’s “alternative lifestyle” is that he can’t move his left arm after his stroke so he still enjoys his trackball as well. Other than cleaning the optical sensors every year for xmas, it is still going after 10+ years of use. I am a trackpad kinda guy, but to each their own. Please note that the “doesn’t leave a mess” is a bit of an exaggeration. 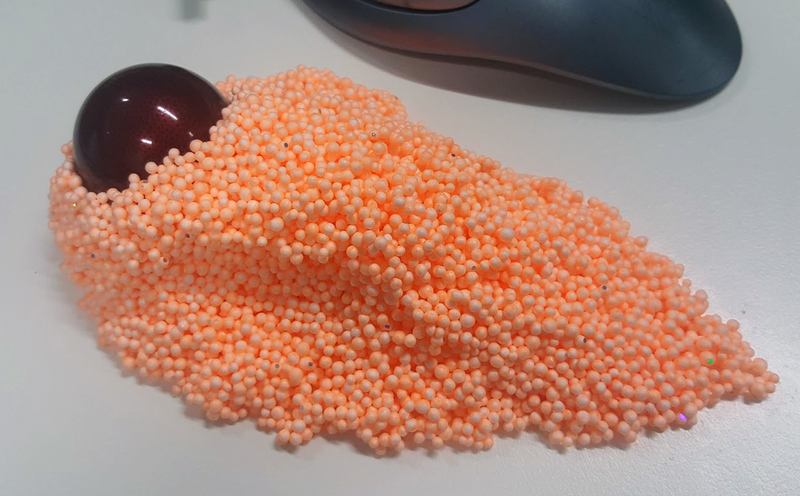 If you leave it sitting on something, it will probably leave some dye behind, and if you beat it up, it will shed tiny styrofoam balls.